Despite only being on their third release, The Chariot has seen a lot of personnel changes. You probably know the band as the brain child of former Norma Jean vocalist Josh Scogin. In fact, with their third release, Wars and Rumors of Wars, Scogin is the only remaining band member to have appeared on either of their two previous full length albums. 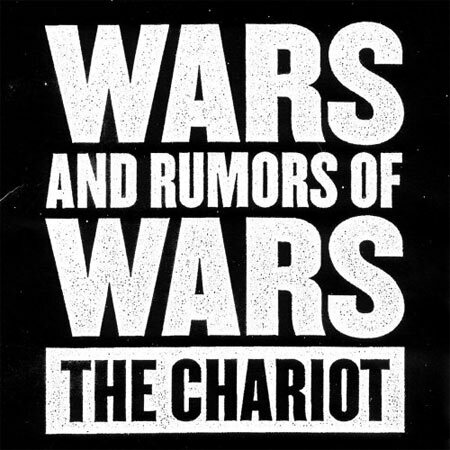 If you haven't heard them before, The Chariot can best be described as desperate metalcore. Scogin screams and cries his way through every track, accompanied by an incessantly driving beat that also conveys a sense of desperation. There are occasional hints of syncopation, for instance in "Never I," but don't expect much. Meanwhile, the guitars grind away on chords and never really do anything particularly compelling. If you're in a bad mood and feel like screaming your mind out, Wars and Rumors of Wars may be a good album for you. Unfortunately, I can't think of much else this album is good for except background music to an emotional breakdown. There is very little variation within each track, and even less between tracks. You will hear occasional interludes of interesting effects, such as whistling, but they are brief. The lyrics are, of course, fairly dark and introspective, and not entirely clear. Don't expect anything obvious to come out and grab you, because there is lots of poeticism here. That said, one line that did jump out at me is from "Mrs. Montgomery Alabama iii:" "Love is easier made than kept." The Chariot aren't a particularly bad band. Nothing stands out as glaringly poor musicianship or bad songwriting. They just aren't particularly good, either. If you're in the right mood, Wars and Rumors of Wars could end up being a great album for you. For the rest of us, it's just pretty mediocre.